Whoever said planning your wedding can’t be a blast? We’re here to make the whole thing fun, easy, and affordable. Keep scrolling to check out our elopement packages and start planning your special day! We really loved everything about our experience. Thank you for doing what you do. The simple fact that I emailed Simply Eloped on a Saturday afternoon two months prior to our wedding date (low key freaking out that we had waited too long) and received a reply from the CO-FOUNDER spoke volumes. 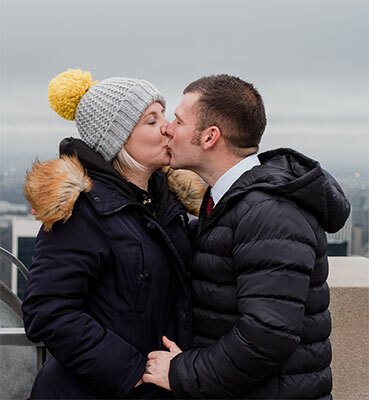 So impressed with Janessa and this company and how even when dealing with a number of people and teams all over the country, Simply Eloped makes your experience feel personal. I will always recommend Simply Eloped to anyone wanting a small ceremony or elopement. I have recommended Simply Eloped to several people since our ceremony and I would do it over and over again! We loved every minute of the ceremony,l and the experience. Janessa, Sarah and Gianna, all are amazing and deserve so much more than me saying Thank you for the most amazing experience. Couldn’t ask for a better service… You all went above and beyond to make our day and time in New York one to remember and we will always be extremely grateful! You’re ready to tie the knot and we’re here to make planning a breeze! Eloping is about focusing on the most important things and we’re here to help. Here’s how it works. We’ll help you pick the perfect destination and venue. We’ve hand-picked vendors that will make your big day shine. Our team will put everything in place for your big day. Welcome to the Rocky Mountains of Colorado. Enormous peaks, alpine lakes, gorgeous national parks and views to set your heart on fire are around nearly every bend. The city that never sleeps! Bright lights, gourmet pizza and people from all over the world make this vibrant city one of the most appealing places to elope. Clear waters, amazing scenery and every color sand you can think of! 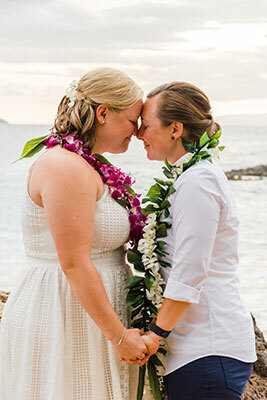 Our Hawaii elopement packages will give you the magic of the islands for your big day. We offer our services on the Big Island, Maui, and Oahu! There's no place as magical as the Big Easy. This historic city is flush with moss-covered oaks, French Quarter streets, intimate jazz clubs and an electric vibe. This city is bursting with adventure for your elopement for both flip-flopped folk and VW Van-enthusiasts alike! Be it surfing, dining, or museums your San Diego, California will be nothing short of an adventure. A mountain town thriving with art, music and breweries and nestled in the Blue Ridge Mountains. With a number of National Parks at a stone's throw, nature is beckoning you to elope to Asheville, North Carolina. Gatlinburg rests at the foot of Great Smoky Mountains National Park. In Gatlinburg, your elopement is bound to be both stunning and scenic. Nature or Dollywood, Gatlinburg awaits! Idaho is a well-kept secret with its private lakes, beautiful mountain ranges, sweeping sunsets and high prairie fields. The City by the Bay; Fog City; The Golden City - there are so many names for this lovely and bustling California city. With so much history and charm, Savannah, Georgia is a beautiful spot for an elopement! Want to elope somewhere Simply Eloped isn’t set up? Let us know! 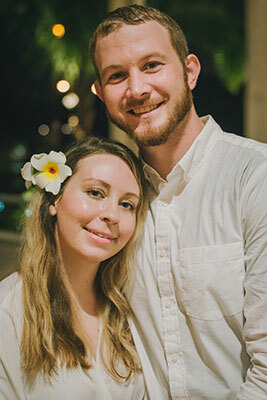 Jess and Austin Drawhorn, one of our awesome officiant + photographer duos, are experienced travelers and can provide custom elopement services all around the world. Contact us to book your elopement in one of these amazing locations with The Drawhorns! We believe your big day should be about you. We’ll get to know your desires, needs and hopes, and then customize your ceremony to match. We personalize everything from the photo styles to the flowers to be a reflection of your relationship. Interested in intimate elopement packages for two? We can do that! Want close friends and family there? We can do that too! 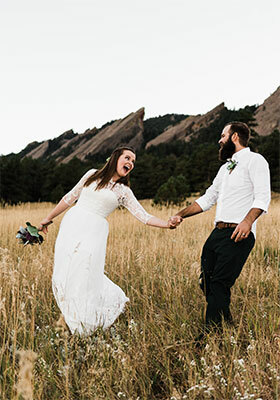 We define an elopement as anything with 20 guests or less, but can certainly accommodate if you’d like to invite more (see here for details). Looking for something a little more exotic? Check out our adventure elopement package!